Wolfs' Books: Harry Potter and the Muggle Resistance. I was zipping through my Twitter feed the other night (06 Feb 2015) when I saw a tweet from J.K. Rowling about "a Black ancestor 'persuading' the Muggle occupant to leave the house." This tweet immediately stopped me in my tracks, this had to be the house from the Order of the Pheonix I thought and started a deep dive into Twitter to see what was going on. It looked like J.K. Rowling was answering questions, and I had missed it. If you did too, then you can, or probably already have, seen the many news articles written about it including one from Time.com, However the best article I read this morning was this one on Mashable. 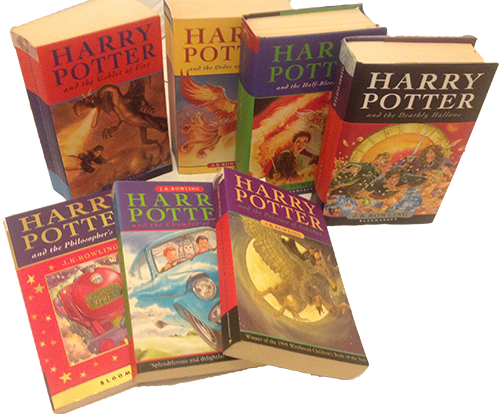 I am a fan of the Harry Potter series and had just finished a Harry Potter movie marathon so Harry and his friends were still rattling around in my mind. 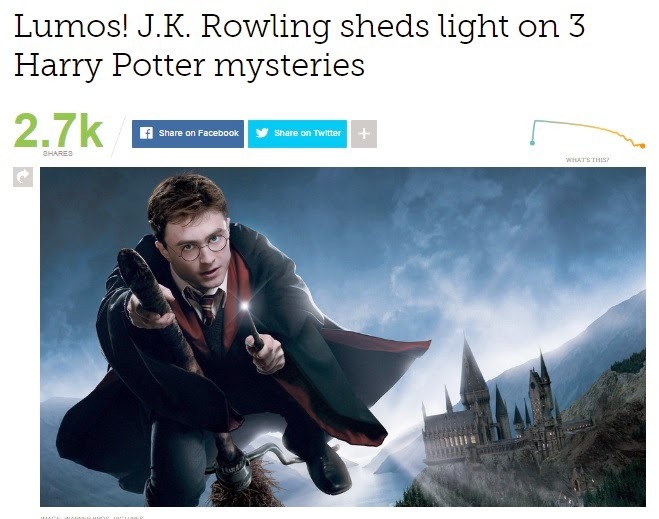 This got me to thinking that I haven't posted an 'Origins' article in a while so why not a Harry Potter / J.K. Rowling one. Harry Potter is an orphan who was living with his unpleasant aunt, uncle and cousin. When he turns 11 he is invited to attend Hogwarts School of Witchcraft and Wizardry, because unbeknownst to him, he is a wizard. During the course of the first book he finds out that he is famous in the wizarding world because he is the only person ever to have survived a killing curse, the same curse which killed his parents. Not only that but this curse was cast by the most powerful dark wizard of the century, Lord Volemort. It rebounded and looked to have killed 'He-who-must-not-be-named' ending a dark time for the wizarding world in general. In this first year he meets Ron Weasley and Hermione Granger, they become lifelong friends and go on many adventures together. Each book describes his trials at school and encounters with the dark wizard, Lord Volemort, who has only just survived his rebounded curse, which we find out 'ripped him from his body'. Now he is trying to regain his body and once re-bodied, regain his control over the wizarding world. In each book Harry and his friends grow older and the adventures get darker, until the final battle erupts between Volemort and Harry and the people who are aligned behind each one. Origins: My first introduction to the Harry Potter series. In the late 1990's I was working as a youth pastor and part of the job description involved teaching Religious Education at various schools in my area. One thing I noticed was that no matter what school I visited, whether it was considered upper middle or lower class most of the kids had a Harry Potter book on their desk or in their bags which was being read! This was not a book that their teachers were making them read either. Being interested in books I had been aware of the Harry Potter phenomenon sweeping the world, but at the time it was always referred to as a children's book so I never considered reading it. I had heard that the books were 'capturing the imagination of children like no other in history, prompting a revived interest in reading.' I can confirm that it did prompt an interest in reading as I saw boys who would rather eat brussel sprouts than open a book, now reading. I finally decided to shell out some money and purchased 'Harry Potter and the Philosopher's Stone'. The local libraries had no more on the shelves and they were booked out for months. After a stint of C.J. Cherryh's Chanur, where the politics were complex, and Robin Hobb's and Kevin J. Anderson's story telling from multiple points of view, the Philosopher's Stone was a nice easy read. Not only that it was compelling enough that I didn't want to put it down. I was enchanted with the secret magical world and delighted with the character building. After reading it I was able to have informed discussions with the children I worked with and noticed that it did break down some barriers and help build rapport with them. Several years later and the first movie had been released, I was now married and working in a Christian book store. The release of the movie raised awareness of this series to new levels and I had people coming into the store asking if we stocked it. Some were upset that we didn't and others glad. Then one day I was inundated with people asking if I keep copies of C.S. Lewis' The Lion, The Witch and the Wardrobe. When I said I did, I came under attack told in no uncertain terms that a Christian book store shouldn't be carrying this in stock because it is encouraging people to use magic! I've read The Lion, The Witch and the Wardrobe, and I don't remember any encouragement to use magic, which I mentioned to several people but they were not going to listen to my feeble excises. Most of these were people who had never visited the book store in the time I had been there, left without purchasing a thing and never returned. As I mentioned I was inundated, this wasn't a one off, so when it happened with a customer I had come to know a bit and felt I could have a reasonable conversation with, the story came out that one of the churches had been warned that people were being lured into the occult because they had read a childrens' book about witches. They had been warned not to be associated with this book and also warned against some older books like C.S. Lewis' The Lion, The Witch and the Wardrobe which was bad because it had a witch in it. I snake you say? Didn't the first book have a scene where he talks to a snake as well? I shouldn't fault someone for trying to take a stand about an issue but would prefer it if they didn't direct their fervor towards me. As Christians we are told in the book of Deuteronomy not to engage in witchcraft or sorcery, so I can understand their misgivings about a boy (Harry Potter) who goes to a school of Witchcraft and Wizardry. As a Christian and former pastor I think we do need to be discerning about not only what we read but about everything we do. I believe that I am old enough and mature enough to understand the difference between fact and fiction and can enjoy a well written series about a boy wizard. I haven't yet let my children read the Harry Potter series but I will when I believe that they can handle some of the darker themes in the story. I will definitely be available to talk to them about the story and explain the difference between fact and fiction when they ask. All up the Harry Potter series is a well plotted and enjoyable story with believable characters, but it should be read for what it is... a work of fiction.